WINSpect recently hit my radar via Twitter, and the author, Amine Mehdaoui, just posted an update a couple of days ago, so no time like the present to give you a walk-through. 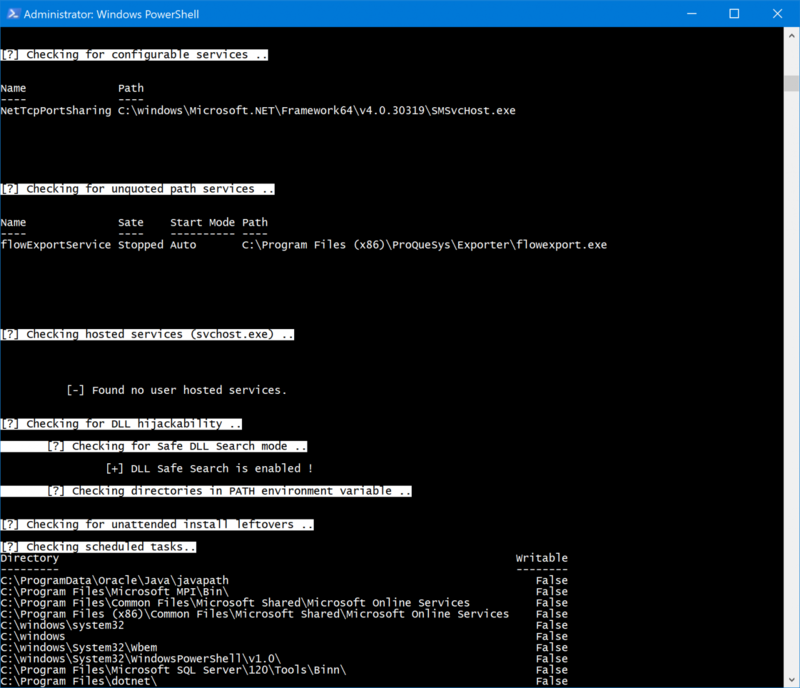 WINSpect is a Powershell-based Windows Security Auditing Toolbox. According to Amine's GitHub README, WINSpect "is part of a larger project for auditing different areas of Windows environments. It focuses on enumerating different parts of a Windows machine aiming to identify security weaknesses and point to components that need further hardening. The main targets for the current version are domain-joined windows machines. However, some of the functions still apply for standalone workstations." I can see this useful PowerShell script coming in quite handy for assessment using the CIS Top 20 Security Controls. I ran it on my domain-joined Windows 10 Surface Book via a privileged PowerShell and liked the results. The script confirms that it's running with admin rights, checks PowerShell version, then inspects Windows Firewall settings. 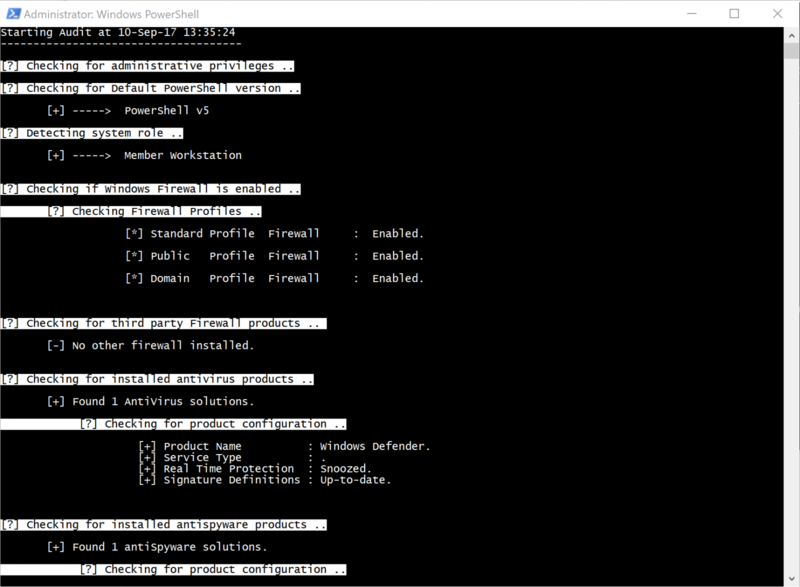 Looking good on the firewall, and WINSpect tees right off on my Window Defender instance and its configuration as well. Not sharing a screenshot of my shares or admin users, sorry, but you'll find them enumerated when you run WINSpect. 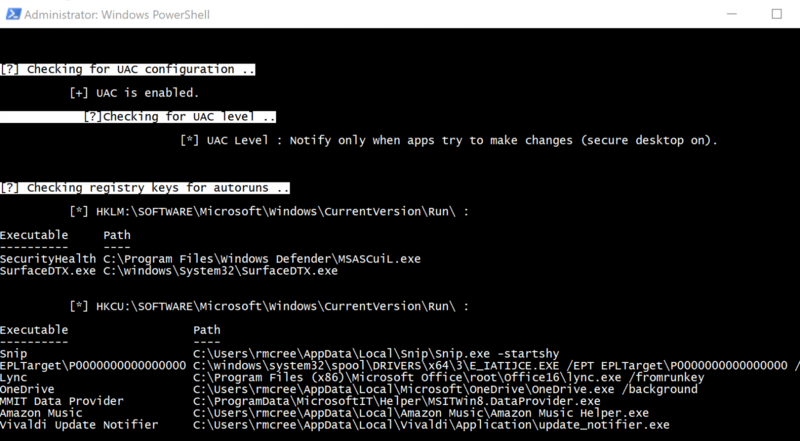 WINSpect then confirmed that UAC was enabled, and that it should notify me only apps try to make changes, then checked my registry for autoruns; no worries on either front, all confirmed as expected. Give it a try for yourself, and keep an eye out for updates. Amine indicates that Local Security Policy controls, administrative shares configs, loaded DLLs, established/listening connections, and exposed GPO scripts on the to-do list.